This morning as I was browsing Yahoo! for some Grammy moments I may have missed, I came across a very interesting article about depression in athletics. It’s no doubt that depression is a very serious mental illness. In the past 15 years, the number of people seeking treatment for depression in the U.S. has doubled; now 25 million a year. This got me thinking. We spend so much time with the people we work with, but we may not be familiar with the signs of depression or what exactly to do if we notice changed behavior. How, as organizational leaders, can we combat depression in our organizations? You can read up on depression by simply conducting a Google Search. You’ll find that the Internet provides some great resources and facts on depression and its causes. 3. Reach out or Ask for Help. If you are a manager and have noticed an employee displaying some of the warning signs above, it may be time for action. You have some options. If you feel comfortable discussing your concerns with your employee, definitely do so. Encourage openness from the employee and ensure them that this discussion is about them, not their performance. Not sure you feel comfortable having this discussion with an employee? Speak to your Human Resources Manager or seek professional advice from an occupational health professional. 4. Be Available. As managers, it can be difficult to balance our workload with employee relations, but it’s something that is important to employee satisfaction and retention. Do your best to be emotionally available to employees. You want your employees to feel comfortable discussing any concerns they may have with you, in order to quickly solve problems, and in this case, help an employee in need. 5. Promote Physical & Mental Health. A business plays a huge role in promoting mental health among their employees. An organization can start by creating a culture that promotes a healthy work/life balance. Establishing this type of culture can be done regardless of business size, budget or industry. Develop Training Programs – Think outside the box! Training programs do not need to be about specific skills related to the job. From what I have heard from my clients, the most successful training programs are those that are of more interest to the employees. This includes topics like stress management, time management, employee expectations or effective communication. These types of skills can be used in everyday life and help promote a healthy work/life balance. Gym Memberships & Other Perks – Many organizations have found that offering free or discounted gym memberships is a great way to promote both physical and mental health. Team up with a local gym or look to build a gym in your current office location. Looking to save money? Skip the gym memberships and simply develop a contest related to losing weight. Get out! – No, seriously. Get out of the office every now and then. Close down the office and head out to do some volunteer work or, better yet, poll your group on what they may want to do together. You can even take baby steps by setting up a happy hour for your team. Conducting these types of activities every now and then is a great way to establish and maintain a healthy work environment. 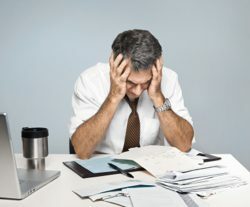 Mental Health Coverage – Your organization may want to look into including mental health coverage into your existing benefits package if you aren’t doing so already. This way, employees can easily get the help they need and may even stop depression before it starts. Depression is a very serious mental illness. If you feel you, a co-worker or friend may be suffering from depression, seek help. Depression, if not properly treated, can lead to more serious problems like self-inflicting injury or suicide. If you feel someone you know may be suicidal, please find additional support here. Corexcel Articles anxiety test, at work health, depressed, depression at work, depression in, Google, Grammys, health in a workplace, Internet, mental health, mental illness, stress, stress test, work and depression, Yahoo!